(Nanowerk News) Despite all the attention given to renewable energy, fossil fuels still produce about four-fifths of the energy consumed worldwide. And there is only one way to burn fossil fuels without adding more CO2 to the atmosphere: carbon capture and storage (CCS). But high cost and simultaneous lack of incentive policies are delaying deployment of CCS, leading the International Energy Agency (IEA) to renew its calls for action in 2013 and beyond on this critical element to limiting climate change. Fossil fuels met 81% of total energy demand as of 2009, as well as 85% of the increase in global energy demand in the past ten years. Such use of oil, coal and gas is irreconcilable with limiting CO2 emissions enough to keep average global temperature rise to only 2 degrees. In the ambitious IEA 2-degree scenario, or 2DS, fossil fuel use is reduced by 20% in 2050 from current levels but would still provide 45% of the world’s primary energy demand. But much of the emissions from that remaining use of fossil fuels must be captured and stored. The recently launched World Energy Outlook 2012 also shows that without significant deployment of CCS, more than two-thirds of current proven fossil-fuel reserves cannot be commercialised in a 2-degree world before 2050. 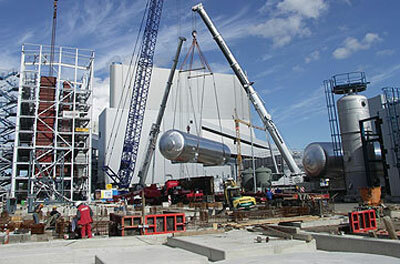 Installing a tank for carbon dioxide at a pilot CCS plant for the Swedish company Vattenfall. CCS involves capturing the CO2 from burning fossil fuels and storing it in deep geological formations so it will not increase the greenhouse effect. Technology exists to capture the emissions of factories such as steel mills and other industrial processes such as natural gas processing as well as power plants that burn fossil fuels or even biomass like wood. But CCS does not come for free: besides the cost of locating and developing a storage site and preparing the infrastructure to pipe the CO2 there, equipment and energy are required to capture and compress CO2 from various flue gas streams, significantly increasing the cost at the capture site. An immediate priority, Mr. Lipponen said, is implementation of IEA-recommended policy and action on storage site screening and development, so that the approval process for storage sites does not impede new CCS installations. Governments must also assess what role CCS will play in their energy futures and increase their efforts in large-scale demonstration. But perhaps the most critically important short-term issue is to develop practical incentive policies, with successful policies for renewable energy potentially serving as models for CCS deployment. The IEA provides detailed plans about development, investment and deployment in its Roadmap series as well as its technology flagship publications, Energy Technology Perspectives 2012. The IEA is revising its CCS technology roadmap, with the new version expected in spring 2013. Though adoption of CCS by many countries has been slow, the good news is that the needed technologies have been proven by many industries over several decades. The Global CCS Institute lists more than 70 large-scale integrated CCS facilities across the world in various stages of development. It is critical that as many of these projects as possible reach fruition this decade to perfect the technology and show CCS’s value and safety to the public.